Need for Speed II is a 1997 racing video game, developed by Electronic Arts Canada and published by Electronic Arts. It is a part of the Need for Speed series and sequel to The Need for Speed (1994), significantly deviating from the emphasis of realism in The Need for Speed to arcade-like gameplay, though it introduces the car tuning. As is its predecessor, Need for Speed II features several exotic cars, and includes tracks set in various parts of the world. The game also opted to remove police pursuits introduced in The Need for Speed. As is its predecessor, the section of music present in Need for Speed II consists of both instrumental "rock" and "techno" music, but with the game's main menu exclusively playing techno music. The game's racing music are composed in a way that each two musical tracks are best played in specific racing tracks, using specific musical instruments and songs relative to the track's location alongside rock and techno musical instruments. The game also allows the player to enable what is known as "interactive music," which allows the game to play specific breaks when the player is driving along a specific portion of a racing track. The feature is also programmed to react to the player crashing, driving slowly, or leading from a pack of racers. These traits are short lived in the initial portion of the series, with only its Special Edition and its successor, Need for Speed III: Hot Pursuit (1998), reusing these features. Only with the release of Need for Speed: Hot Pursuit 2 (2002) was both rock and electronic music featured in the play list again, while interactive music was only reintroduced to a limited extent with the release of Need for Speed: Most Wanted (2005), which extensively uses the feature in police pursuits, the music reacting to the heat level the player is currently in, and the player hiding or being arrested. Need for Speed: Carbon (2006) features interactive music additionally in canyon races, reacting to whether the player is in the lead, or if the player wins or rams through a guard rail and falls over the edge of the road. As in the original Need for Speed, the game features detailed specifications, history, and audio commentaries on each vehicle. The largest feature was several full motion video (FMV) segments for each of the cars, several of them being the professional produced videos for the concept vehicles. Additionally, each vehicle interior could be viewed through genuine photographs taken in a 360 degree panoramic view. This marks the last time such extravagant features are to be found in the Need for Speed series as future games render any material completely in 3D. Released on November 6, 1997 in the United States and February 2, 1998 in Japan and Europe, the special edition of NFS II includes one extra track, 4 extra cars, 3 bonus cars, a new driving style called "wild", and 3dfx Glide hardware-acceleration support. These new features add up to a substantially improved game. Because the Voodoo Graphics and the Voodoo Rush were the only 3dfx cards available at the time of the game's release, and because Electronic Arts did not future-proof the game's installer, later 3dfx graphics card models such as the Voodoo 2 are not detected during the NFS II SE installation process (a pop-up will confirm 3dfx detection). Subsequently, the installer doesn't copy from the disk the secondary version of the program with 3D acceleration. This problem is easily solved by manually copying and running the alternate executable file. Glide wrappers are available for non-3DFX graphics cards so that modern computers can run the game with hardware-acceleration. Several Glide wrappers with support for the game are dgvoodoo and Zeckensack's Glide wrapper. 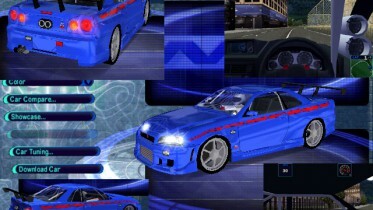 Besides smoothing out the in-game textures, the 3dfx version of the game also features additional visual effects not found in the software version, such as car reflections, weather, improved fog, shading, improved skybox rendering and transparent in-game menu overlay featuring a rotating view around the player's car. These visual enhancements are standard in both the software and hardware accelerated versions of Hot Pursuit, High Stakes, and "Porsche Unleashed".